The health benefits of alfalfa sprouts are extraordinary. This food is suitable for those who are dieting because the sprouts are able to increase the supply of nutrients, low in calories and has a delicious flavor. Alfalfa sprouts are also good for preventing aging, losing weight, maintaining digestive health, controlling blood sugar, even good for healthy bones, heart, and lowering bad cholesterol. This sprouts are also able to increase estrogen is useful for women’s health in preventing menopause and regulate menstruation. This sprout is a young seedling of the alfalfa plant, in scientific language called “medicago sativa”. This is a vegetable from the Middle East, usually in the vegetable when young (sprouts). When the old leaves are bitter so not many who consume them, while sprouts have a lighter taste. 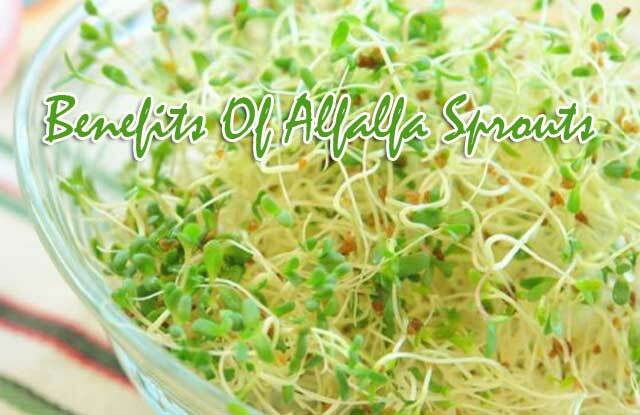 In addition to vegetables, alfalfa sprouts can be added to the salad, sandwitch, as topping, soup and various other foods. Alfalfa sprouts high in mineral content, including phosphorus, potassium, calcium, magnesium, iron, copper, vitamin C, vitamin B, vitamin A. Among the types of B vitamins are thiamin, riboflavin, and pantothenic acid. In 33gram alfalfa already contains 13% daily vitamin K intake, but this is very low in calories, it is only 7.6 calories and has a very low glycemic index. Alfalfa sprouts are also loaded with bioactive compounds such as saponins, phytoestrogens, flavonoids, alkaloids, coumarin, phytosterols and amino acids. Here are some benefits of alfalfa sprouts for a very well known health. Let’s check one by one. Alfalfa sprout contains antioxidants, phytoestrogens that work to balance hormones, reduce inflammation, and prevent the formation of cancer cells. So, it is very important to include these sprouts into the daily diet such as salad or cake topping. This is thanks to the high content of phytoestrigen and vitamin K in alfalfa which is useful for balancing the hormone estrogen. In turn will reduce the symptoms associated with menopausal hormones. As for menstruation, alfalfa contain many vitamin K is useful to freeze blood. This will prevent uncontrolled menstrual bleeding. As told at the beginning of the article, that alfalfa sprouts are useful for weight loss. These foods are low in calories and high in fiber content that is useful to provide a longer satiety. This will prevent you from increasing the portion of the meal. In addition, the vitamin works to increase the body’s metabolism so that the process of burning fat becomes faster. However, you are not recommended to eat in excessive portions. Alfalfa if in excessive eating can cause toxicity. Furthermore, alfalfa’s health benefit is to prevent diabetes. For those who experience diabetes symptoms is very good to consume alfalfa sprouts. Fiber content is able to regulate glucose and insulin remain balanced. Eating sprouts regularly is good for preventing metabolic syndrome and other bad symptoms associated with diabetes. The results of research in the past states that consuming alfalfa sprouts can reduce the level of bad cholesterol. This news is very useful for those who have potential for coronary heart disease. Sprout work to remove plaque and fat that clog the arteries and blood vessels, this can also prevent heart attacks and stroke risk. Vitamin C is beneficial for boosting immunity and in a piece of alfalfa sprouts already contains nearly 15% daily requirement. Vitamin C will stimulate the formation of white blood cells that are good for immune and prevent infection and inflammation. Fiber is very important for body to maximize digestion and ease stool expenditure. Alfalfa sprouts contain fiber in high capacity, it is known to reduce constipation and diarrhea. In fact, alfalfa is known to prevent colorectal cancer. One of the best benefits of alfalfa sprouts is to prevent osteoporosis. This is because the sprouts are rich in iron, copper, calcium, vitamin K. So, taking alfalfa regularly is beneficial for lowering and preventing early osteoporosis. Alfalfa sprouts contain lots of B vitamins that can increase the body’s metabolism significantly. This will keep the continuity of the enzyme and hormones remain smooth and this affects the body functions. Alfalfa sprouts claimed have amazing benefits for skin health because it contains high antioxidants. That is, those who diligently consume alfalfa will avoid premature aging such as the appearance of wrinkles on the face, and sagging skin. Another benefit of alfalfa is to stimulate hair growth and strengthen hair because it contains protein. In addition, this sprouts are also able to accelerate the healing of heavy wounds vitamin k content in his possession. However, the side effects of too much vitamin K is a cause of heart problems due to excessive clotting of blood.